Bulldog Mixes - How Many Of These Crosses Can You Name? You are here: Home / Breeds / Mix / Bulldog Mixes – How Many Of These Crosses Can You Name? Bulldog Mixes – How Many Of These Crosses Can You Name? Bulldog mixes are extremely popular among dog-lovers from all walks of life. But with so many adorable bulldog mixes, how does one choose? Whether you’re trying to decide between a Bullador, an English Boodle, a Bull-Boxer or another popular variety, we hope this list of common Bulldog mix breeds will help you! First and foremost, any potential Bulldog mix owner should understand the Bulldog itself! The Bulldog is one of the most popular breeds in America, consistently ranking in the top 10 most popular breeds, according to the American Kennel Club. Both the traditional Bulldog (also known as the English Bulldog) and the smaller French Bulldog are popular choices for family pets. So are the various Bulldog mix breeds we’ll discuss in this article. Historical evidence suggests that the Bulldog’s history dates back to 13th century England. The Bulldog has a storied history, with roots in a bloody sport — bull-baiting. In this cruel activity, a pack of dogs (usually Bulldogs) fought a staked bull, while spectators watched. Once this bloody pastimes was banned in the mid 1800s, Bulldogs began their transition from ferocious fighter to affectionate companion. As breeders refined this once-rough breed into a friendly and loving companion, the Bulldog gained popularity. It made its way to North America in the 1800s, and was recognized by the AKC in 1886. Today, the Bulldog remains a symbol of England, and a popular companion worldwide. The Bulldog is a friendly, courageous, and calm breed. Its short, stocky build is unmistakable. It has an average weight of up to 50 pounds, with a height of just 14-15 inches. The appearance of the Bulldog is so unique that even mixes show obvious Bulldog characteristics. The loose skin of the head, the short, pushed-in nose, and the perpetually furrowed brow all scream BULLDOG! While adorable, the Bulldog is prone to a wide variety of health concerns. The overbreeding of this popular pup has lead to all sorts of issues in purebred Bulldogs. This is one reason so many choose to crossbreed for better genetic diversity. The Bulldog is an extremely popular dog, despite the fact that they have significant health problems. Bulldogs suffer from brachycephaly, respiratory disorders, spinal deformities, hip dysplasia, and many other significant health concerns. You can learn more about Bulldog health problems in our full Bulldog guide. Breeding purebred Bulldogs has become somewhat controversial in Britain, although it remains popular in America. Generally speaking, crossing a Bulldog with another breed will help somewhat to mitigate the potential for serious health concerns. This is one reason Bulldog mixes are so popular. Breeders want to retain some of the characteristics of the English Bulldog, while hopefully producing a healthier dog. Bulldogs are also mixed for looks, and to produce mixes of various sizes. To get a better idea, see our list of some of the best Bulldog mixes in the sections below. Bulldog mixes will take on characteristics from both parent breeds. We already know about the Bulldog’s temperament, physical appearance, and potential health concerns. So we just need to look at the other parent breed’s characteristics to get an idea for what each Bulldog mix temperament may be like. There are many potential Bulldog mix options. Some of the most popular are described below. The Bull-Boxer is a term that can sometimes refer to a Boxer mixed with any type of Bull (such as a Bull Terrier, Pitbull, etc.). In this situation we are referring to a Boxer mixed with English Bulldog. The Boxer is a working breed, and they tend to be quite energetic. They are very intelligent, as well, which means the Bull-Boxer mix needs plenty of mental and physical stimulation in order to avoid boredom-associated destructive behavior. As a mid-sized dog, a Bull-Boxer will likely be bigger (or at least taller) than a purebred Bulldog. The appearance will largely depend on which breed ends up showing more strongly, but generally speaking Bull-Boxers have less of a wrinkly face than pure Bulldogs. The Bull-Aussie is is a mix between the noble Australian Shepherd and the stocky Bulldog. The Australian Shepherd is a proud and hard-working breed that loves to have a job to do. As a herding dog, Aussies need lots of exercise and engagement from their owners. A Bull-Aussie mix will typically have short, dense hair and often adopt the interesting color patterns of the Aussie. A highly intelligent crossbreed, Bull-Aussies can be a handful at times, as they can show a bit of a rebellious or stubborn side. But with proper care and plenty of exercise, the Bulldog Australian Shepherd can make a great companion. The Beabull is a cross between the Beagle and the English Bulldog. This adorable cross-breed will take on some characteristics of both parent breeds, usually retaining some of the facial wrinkles of the Bulldog and the droopy, large ears of the Beagle. They are usually medium sized, relatively short dogs. The temperament of both breeds shines through, as well. Beabulls are usually very friendly, curious, playful and courageous. But of course, as with any crossbreed, you never quite know what you’re going to get with the Beabull, as either breed could come through stronger. The English Bull Springer is an interesting mix between two English-heritage dogs, the Bulldog and the Springer Spaniel. A midsize to large dog, the Bull Springer will adopt some characteristics from both parents – often including the curly, soft hair of the Springer Spaniel. As for their temperament, the English Bull Springer is typically a very gentle, friendly, and active dog. The Bull Jack is a mix between the Jack Russell and the Bulldog. Bull Jacks are on the smaller side of Bulldog mixes, due to the Jack Russell’s smaller size. They have short, dense hair that is relatively low-maintenance. That said, the Terrier’s mischievous, sometimes destructive side can come through, so make sure your dog gets enough exercise! Terriers are very active, and really do need a job to do, even more so than larger working breeds. This mix is definitely not for everybody! The Bullador is a mix between the Bulldog and the ultra-popular Labrador! When you cross two of the most popular breeds in America, you’re bound to get a friendly and popular cross-breed. The Bullador mixes the friendliness and loyalty of the Bulldog with the friendliness and loyalty of the Labrador! This makes for a very sweet, loving, and fun companion. Physically, Bulladors are large dogs, usually at 50 to 80 pounds. They will inherit physical characteristics from both parent breeds, although the exact appearance of the mix is unpredictable. The English Boodle is a mix between the Bulldog and the standard Poodle. This mix brings together the looks and personality characteristics of these two popular breeds. The curly hair of the Poodle typically comes through strongly, while the stockiness of the Bulldog is often significantly muted by the tall, stately genetics of the Poodle. Personality-wise, the Bulldog’s friendly nature blends with the playful Poodle to create a fun companion dog or family pet. They are a highly social, highly active breed. The Miniature English Bulldog is a cross between the pocket-sized Pug and the stocky Bulldog. Also known as the Toy Bulldog, Bullpug, and a dozen other names, this is quite a cute crossbreed. Unfortunately, they are very prone to serious health concerns, so we do not recommend this cross. Both parent breeds of this mix have a brachycephalic facial structure, which contributes to trouble breathing, eating, and more. Since both breeds are prone, there is a very high likelihood that your Bullpug will suffer from some sort of health issue. As cute as they are, this is not a good crossbreed to seek out. The English Bullweiler is a mix of the hard-working Rottweiler and the friendly Bulldog. This is a much larger dog than most breeds on this list, sometimes falling into the Giant category at up to 100+ lbs. It’s also a more stubborn breed, which may require more training than most Bulldog Mixes would. That said, the Rottweiler in this mix makes the Bullweiler a fiercely loyal, protective dog. This can be a pro or a con, depending on your needs and confidence handling larger, more aggressive breeds. This mix is not for everyone! There are certainly other Bulldog mixes out there, but these are some of the most popular! What’s your favorite Bulldog mix? Is A Bulldog Mix Right For Me? As cute as Bulldog mixes are, we can’t recommend these crossbreeds to our readers. This is mostly due to significant health concerns with the Bulldog itself. The purebred Bulldog has a litany of health problems. Everything from dental and eye problems, to hip dysplasia, to respiratory issues are worryingly common in the Bulldog. Perhaps the most worrying aspect of the Bulldog is their brachycephalic facial structure. Brachycephalic syndrome, or “flat face” syndrome, leads to respiratory issues. Bulldogs have trouble breathing while exercising or while in hot weather, and they tend to snore and snort frequently. They are prolific droolers, and many struggle to breathe while eating, causing choking and gagging. 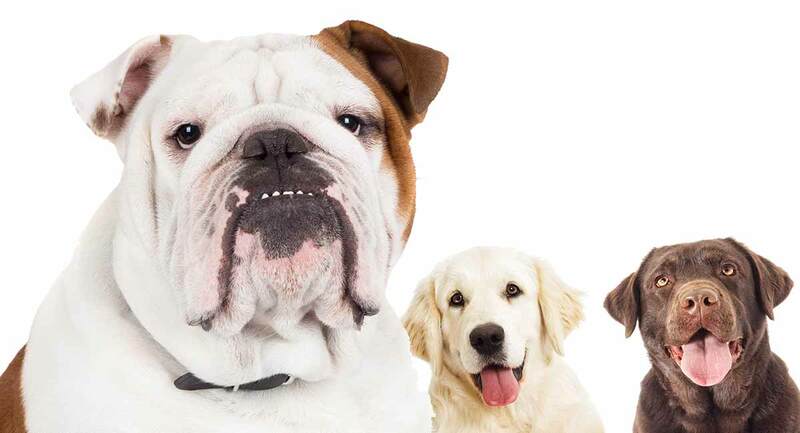 Although crossing the Bulldog with another breed can help to reduce the likelihood of serious health concerns, there’s still a significant risk with any Bulldog mix. Thus, we can’t honestly recommend Bulldog mixes to our readers. As cute as they are, the health concerns are too significant. Pedersen, N. C., Pooch, A. S., & Liu, H. (2016). A genetic assessment of the English bulldog. Hendricks, J. C., Kline, L. R., Kovalski, R. J., O’Brien, J. A., Morrison, A. R., & Pack, A. I. (1987). The English bulldog: a natural model of sleep-disordered breathing. Hendricks, J. C. (1992). Brachycephalic airway syndrome.